Lady Pirate Ashlee Howell battles a defender for the ball during their 11-2 tromping of Frenchtown on Thursday, where Howell scored twice. 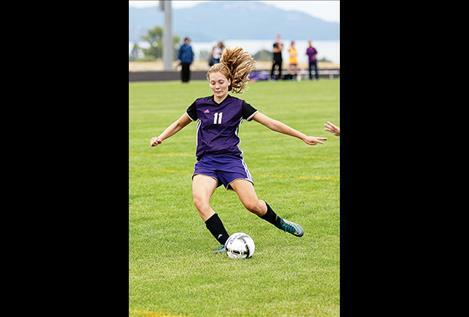 POLSON – The Polson Lady Pirates opened their 2018 soccer season Thursday afternoon at home by taking down Frenchtown 11-2 behind the four-goal performance of Ali Hupka. Hupka got the Lady Pirates on the score board early with a goal in the three-minute mark on an assist from Ashlee Howell. 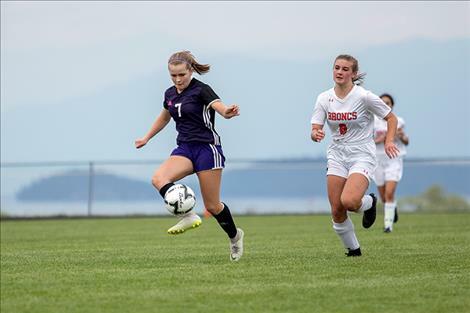 Along with the three first half goals by Hupka, Howell scored twice and both Autumn Burland and Sophia Moderie each scored a goal as the Lady Pirates entered intermission leading Frenchtown by a score of 7-1. In the second half, Megan Rost, Hupka and Burland each scored goals. At the end of the day, Rost had four saves while in the box and the Lady Pirates had 16 goal shots. 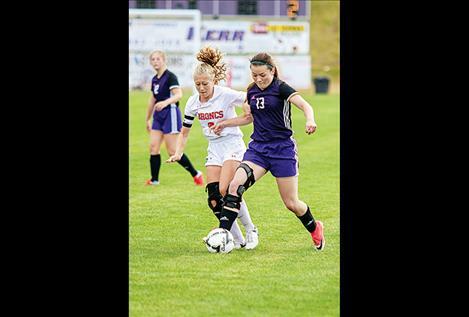 In the first road game of the season, the Lady Pirates battled Loyola to a tie. The teams played to a 2-2 tie in the first half of action, Howell scored twice, once at the 8:48 mark on an assist from Burland and on a Moderie assist at the 13:17. 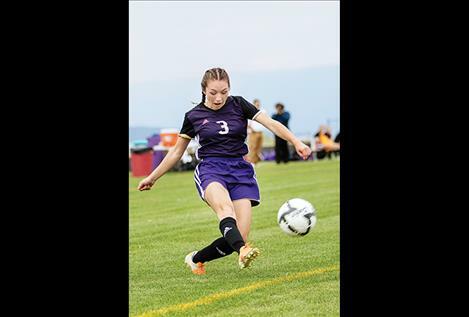 The Lady Pirates went up 5-3 on goals from Howell, Moderie and Kyla Heiser in the second half, but Polson saw host Loyola rally in the final minutes of regulation and score two goals for a 5-5 draw on Saturday afternoon in Missoula. Loyola outshot Polson 20-16 on the day and 15-11 in shots on goal. Lady Pirate Megan Rost collected 10 saves. The Lady Pirates will entertain the home crowd with back-to-back games when they welcome Billings Central to town at 3 p.m. on Sept. 7 and Laurel at noon on Sept. 8.